Children are naturally drawn to insects, especially ladybugs. 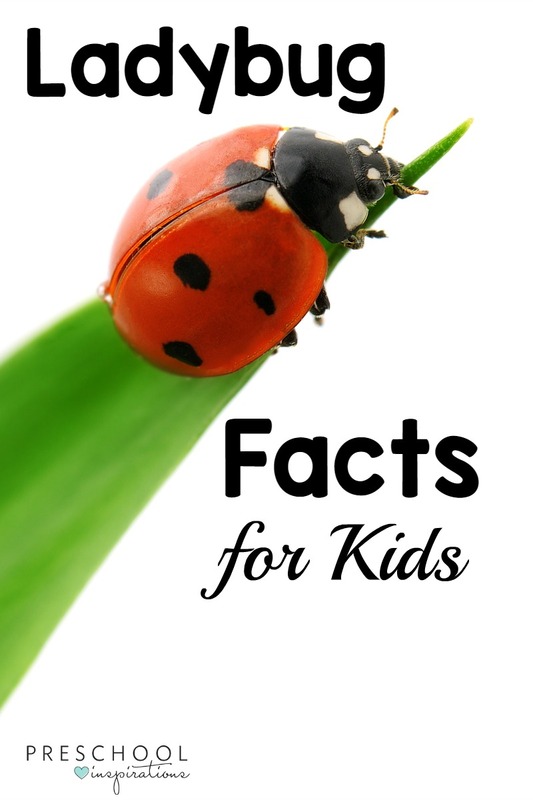 Here are 20 ladybug facts for kids to share while observing ladybugs, while talking about them, while reading about them, or even during circle time. Maybe you even have a ladybug unit in your preschool curriculum! If you need a great fact based ladybug book, we love “Ladybugs” by Gail Gibbons or a fun read aloud book is “The Grouchy Ladybug” by Eric Carle. My preschoolers and I recently witnessed 1,500 ladybugs being released into our greenhouse, and it was incredible. We are talking constantly about ladybugs now, also known as ladybirds, and I thought I would share our findings with you. It is great to have fun ladybug facts for kids to talk about as you are observing them! 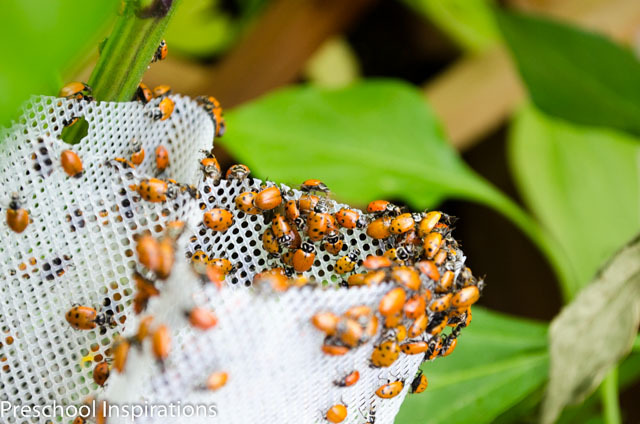 As you’ll see from my pictures, our ladybugs had a feast in our greenhouse. 1) Ladybugs are a type of beetle. 2) Some ladybugs have no spots and others have up to 20 spots. 3) To help defend themselves, ladybugs play dead. They also can release a yellow fluid that other bugs find stinky. 4) The color of the ladybug sends off the message to its predators that it may taste bad or be poisonous. 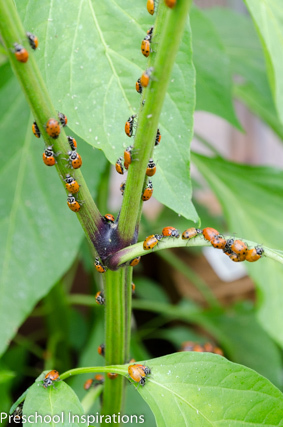 5) Ladybugs cluster together as a way to “deter predators by increasing the concentration of their smell and their warning coloration.” Thanks to Professor Rick Lee for this fact! 6) When the temperature is near 60 degrees Fahrenheit or around 16 degrees Celsius, the ladybugs become active. 7) Ladybugs are both male and female. 8) A ladybug can live up to a year long. 9) There are two sets of wings. The outer set is the hard shell for protection, and the inner set are what it uses to fly. 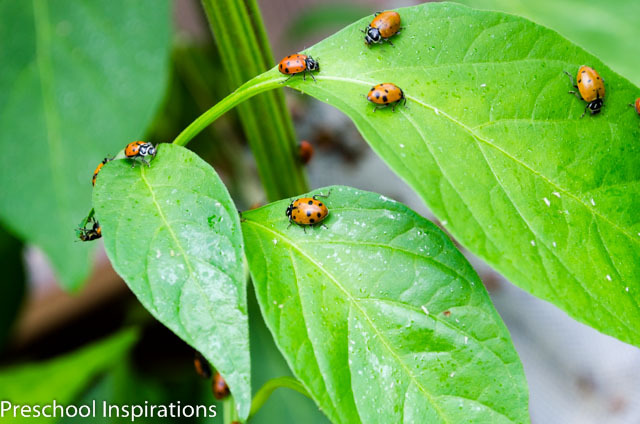 10) Ladybugs are very helpful to a garden as they eat aphids and mites, which are bugs that are harmful to plants. 11) An adult ladybug can eat up to 50 aphids in a day. 12) Ladybugs taste and smell with their antennae. 13) A ladybug lays its egg on a leaf. They are yellow eggs that turn white. 14) They come out the egg as larvae (Lar-VEE). If there is just one, it is a larva. 15) The larvae resemble tiny black alligators. 16) The larva sheds its outer skin, which is called molting. This happens after it has eaten too much that it’s skin becomes too tight. 17) After the larva is done molting, it becomes a pupa. 18) The pupa sticks itself to a safe place where it will not move. The pupa breaks open as the ladybug comes out. 19) The ladybug’s body goes from being soft with no spots to the hardened and spotted ladybugs we are familiar with. 20) The inner wings used for flying must dry before the ladybug can fly. Feel free to read through some fun facts about spiders as well as facts about butterflies too. Many of these fun facts were discovered as we read one of our favorite books called Ladybugs by Gail Gibbons. Thank you for pointing that out! I can’t remember which book we found that in, but I will be sure the post is corrected :). I appreciate you sharing your expertise.